Anybody who has ever done business with Americans can testify that there are more differences than similarities between Americans and most business cultures in the rest of the world. There are differences in cultures, values, etiquette and even ‘common’ business language – which is quite often, well, uncommon. When it comes to building relationships and doing business deals with Americans, understanding and appreciating these behaviors, culture and business manners is vital to success. Everybody wants to work with people they relate to, who they believe they can trust -- and ultimately who ‘speak my language’. 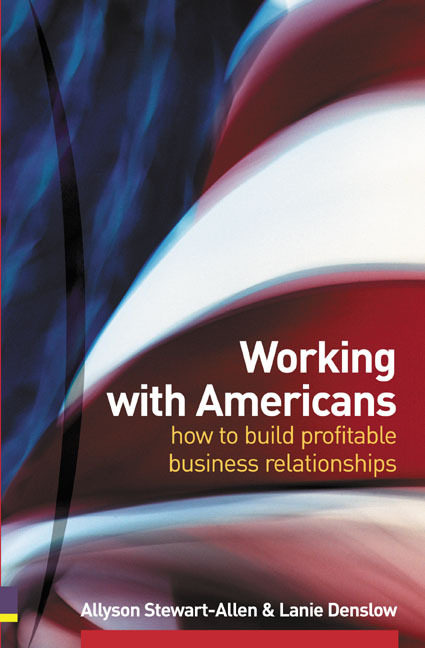 Working with Americans not only illuminates why Americans think and operate as they do, but also shows what you can do to play to your US colleagues’ preferences and business practices. This is the guide to understanding Americans in business, their culture and thinking which will make you a more informed and confident manager and envoy. With confidence enhanced, you can be more relaxed, have fun, and focus on building lasting, profitable relationships. How Big It Is: Its hard for people to understand the size of the US. Think in terms of a business flights: An hour from London youre in another country. An hour from Los Angeles youre still in California! Four hours from Paris takes you to Moscow. Four hours from New York doesnt even get you to California. My Way or the Highway: Americans are independent and spirited. Believing that everyone is created equal, they also hold the idea that each person is special and entitled to express themselves. A fast food chain slogan "We make it your way" responds to this attitude. Whether it is structuring the hours they work, ordering coffee, or buying a pair of jeans Americans want choices and to make their own selections. Lawyers:Although the US has only 5 per cent of the worlds population it has 70 per cent of the worlds layers (about 1,000,000). Although the world thinks all lawyers in the US are simply there to sue someone, in reality they serve as business advisors helping US corporations craft detailed contracts aimed partly to AVOID lawsuits. Clock is King. When dealing with Americans its critical to recognize their focus on time, schedules and agenda. Best advice: Be on time, stick to meeting agenda, know that your US based counterpart doesnt intend to be rude when they dont chat; they just feel rushed all the time. Amazing Variety. America founded adventuresome pilgrims and continues to welcome people from throughout the world. The cities, marketplace and business cultures reflect the unique attitudes and experience of these immigrants. In addition, the US has well defined regions (West, East, South and Central) each with its own special food, speech and business rhythm. Further, Americans vary by age, education and experience. Before you come know that all one-size, one approach does NOT fit all. "If you are working for or with USA Inc., the authors detailed analysis of American corporate culture is an invaluable roadmap." For many people, Globalisation means Americanization, but successful economic development also needs cultural understanding and trust. This book will give you a real insight into how to build successful relationships with the wonderful folk from "Gods Own Country". The best thing in management is cross fertilization. The best in cross fertilization is cultural integration. The best in cultural integration is to combine American management good sense and simplicity with European flair. This book not only helps you avoid misunderstandings, but more importantly makes you understand how this unique combination can work. the book I hope you will read!" I am extremely impressed by the quality and the new enlightenments of Allyson and Lanie's book."